Justin Seier’s TeamMates journey started in Wood River nearly 12 years ago. “My sister was in TeamMates and suggested I be a part of it,” he said. 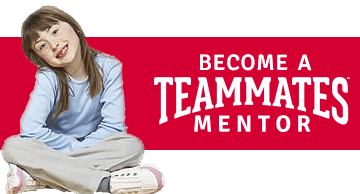 Justin joined TeamMates as a mentee when he was in sixth grade. His mentor was the school guidance counselor. Justin said he spent most of his free time outside of school visiting his mom in the hospital, so he and his mentor worked on homework during their meetings. After a couple years, his first mentor accepted another job outside of the district. That next year, he was matched with her replacement. They met until he graduated from high school. Justin said both of his mentors have played a huge role in his life. Now, Justin is back in Wood River serving in two roles— an educator and a mentor. Justin and his mentee have been matched for about a year and a half. He said he expects a lot more fun conversations in fifth grade. As a Paraprofessional, Justin works with students during the day, but meets with his mentee once a week right after school. He said his first meeting was like déjà vu. Justin’s impact as a mentor stretches further through the Wood River program. He also serves as treasurer on the chapter’s board. He said he feels his dedication to the program and to the school is a big part of who he is. Justin said he’s working to become a special education teacher. As an educator, a board member, a former mentee, and a mentor, he can call Wood River Rural Schools home.